Richard Seeley returns on his highly promising Glue Music imprint with a brand new EP of techno backed with remixes from Public Lover and Klunk & Zilly. Richard, who launched the Glue Music imprint at the end of 2010, kicks off proceedings with the well received ‘Black Room EP’. Since then the label has seen releases and remixes from Andreas Georgiades, Michael J Collins, Justin Drake & MWA and has garnered support from DJs including James Teej, Art Department, Huxley and Glimpse. 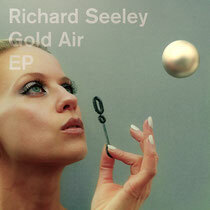 Seeley is already well known for his recordings for the likes of Rekids and Veryverywrongindeed but with his own label gaining such ground his musical focus has naturally gravitated to Glue Music, and so to the latest release, the ‘Gold Air EP’. The record kicks off with the original version of ‘Gold Air’, a deep, stripped and brooding slice of techno that navigates a tight, percussive groove with restrained style. Following hot on the heels we have ‘Flare 8.1’ which takes a deeper tact, drawing on hypnotic filtered loops to create a Basic Channel style feel. The last of the original tracks comes in the shape of ‘Always Be’, a percussion laden workout that fuses Latin rhythms with edited vocals and a rollin techno backing. The packages is rounded off with two remixes, first Public Lovers get to grips with ‘Gold Air’, turning in a quirky slice of jazz infused techno and the other remix is provided by Klunk & Zilly AKA Terry Francis who takes ‘Always Be’ and reworks it into a dubby version dripping with tape delay and exuding a real tribal quality. Out 5th March on Glue.